Two months have now passed since the passing of Gyp, and we are crossing into the outfield of two years’ exploring a life of enchantment on the roads less traveled, hence the blog post title. There was, though, a pit stop at our nonagenarian parents’ house in San Diego to perform some Bodhisattva carpet installation and minor repairs throughout. Ruth set a tantalizing goal of researching the restaurants in town that held the historical provenance of “oldest in continual operation.” It would be our challenge to sample and explore, eat and drink in as many as possible during our temporary residency. Look for her fascinating blog post to come. All business completed, we pushed east into Alpine, California, to the cozy home of Brian and Nancy in time to participate in a house music concert, which was sublime indeed. The Eve Selis Band, comprising a posse of incredibly talented master musicians, arrived with an approximate combined devotion to the muse of music of nearly 200 years. An intimate venue embracing approximately 50 people, in the presence of a band that can play pretty much anything in your imagination, who had shared the stage with some of the world’s best musicians, cradled in the living room of a welcoming desert home, is mystically transformative. There is something unique in live music where musicians and participants share a synergy of energy not unlike a musical Fibonacci series—or Golden Mean—where one plus one morphs into three, growing and spiraling exponentially into mystical transformative change. If you take a series of numbers, start with 0, 1… and calculate each successive number from the sum of the previous two (e.g., 0+1=2, 1+2=3, 2+3=5, 3+5=8, etc. ), you are now exploring the Golden Mean. Let’s take a moment to examine our musical scale in relationship to Fibonacci: There are 13 notes in the span of any note through to its octave. For example, the octave of C on the piano has 13 notes in total: 8 white keys and 5 black keys. However, to play the scale of C, we only play the 8 white keys. A scale is comprised of 8 notes, of which the 5th and 3rd notes create the basic foundation of all chords. We also have harmonizing intervals of 3rds and 5ths. To produce a 3rd, we play the first note and a note 2 tones higher than this note. To play an octave, we play the first note, and then another note 8 tones higher. Note in all the above, (which is the basis of all music), all of the notes and intervals only use Fibonacci numbers 1, 2, 3, 5, 8, and 13. The series can also be used when composing music to make patterns of notes that are pleasing to the ear. Experts claim that classical composers like Mozart and Bartok used the Fibonacci Series in some of their pieces. More contemporarily, rock & roll music leans heavily on power chords, which are 5ths intervals. 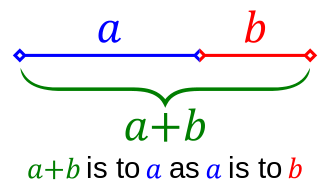 The above diagram represents the Golden Ratio. It can be represented simply, without performing a quadratic formula as 1.61803…or mathematically notated as “Phi.” If you draw a line 1.61803 times larger, or 61.8% larger, than the one before it, you are traveling along the Golden Mean. We need fingers to play our musical notation as described above, and just looking at our fingers to perform this act we see the distance between each joint in each finger matches quite closely the Golden Ratio, as does the ratio of forearm to hand. Leonardo Da Vinci recognized this series in facial patterns, and applied it to one of his most famous portraits, the Mona Lisa. Nature is chockablock with examples of this nature, seen in the spiral growth of plants, flowers, and shells; and it is found in art and architecture that “for some reason” pleases us. The great masters knew of this synergy and played it. Live music taps into the heart stream of this magic, and the people who entered into this musical cradle were rocked and rolled, leaving with their atoms excitingly rearranged and reassembled in a new place. Warning! Opening this door could cause you to enter an awakening of mind, similar to that enjoyed by Donald Duck in the 1959 Walt Disney short film, Donald Duck in Mathmagic Land. Mid-November finds us in sunny and warm Anza Borrego State Park to reprise a memorable visit a year ago. We begin training hikes to ramp up to our next year’s Pilgrims Way walk from London to Canterbury, England, and several months’ worth of deep in-country exploration. Thanks to Ruth’s research, we will boldly go where few tourists travel, snooping below cathedral carpets for hidden crypts, stalking narrow corridors along dark twisted back streets, embracing in fire-warmed corners of local neighborhood pubs, blowing dust off antiquarian books stacked in dimly lighted museum libraries, deciphering hidden messages on hand-stitched tapestries, and much more…. Some people have asked us why we don’t monetize our blog site, that is, apply links to products that we have found useful along our journey as full-timers (and get kickbacks from Amazon). This works successfully for many as a supplementary “on the road” income, but our intent is to keep this body of work fully in the realm as described in Latin in the old opening movie credits for MGM: Ars Gratia Artis (art for art’s sake). This is not to say that at some point we won’t invite you to purchase an eBook of this rapidly expanding treasure trove of travel trekking. Stay tuned.